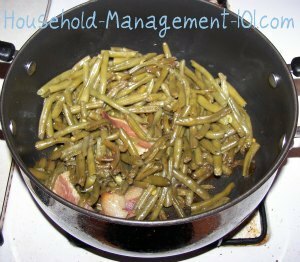 Here are step by step instructions, with pictures, of cooking green beans southern style, with salt pork for hours. It's a great family recipe. In fact it is one of my family's favorite Thanksgiving recipes, although we also eat it with regular meals and other special occasions too. Many people, when learning how to cook green beans, believe that the green beans should stay crisp after cooking, and turn up their nose at "soggy beans." Why? If you've not tried green beans, southern style, you are missing a real treat. I like crisp green beans too, but once they are slow cooked for hours they have a completely different taste, and are basically like eating a completely different type of vegetable. In my family, on both sides, and in my husband's family too (we are all from Kentucky, by the way) every matriarch has a recipe for cooking green beans, and there is pride involved in who cooks them best. So, here are my instructions for how to cook green beans, southern style. 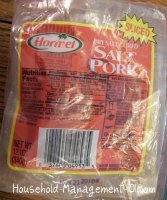 ** My husband's side of the family prefers salt pork, and I like it too just because it is easier to work with, in my opinion. My father's side of the family prefers a ham hock. Use whatever is available, that you prefer. 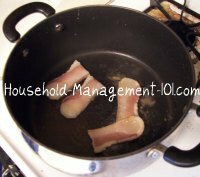 This recipe is a family favorite, but it is mainly done on special occassions though because prepping the beans to cook them can take quite a while. Of course, when a large family get together happens we can sit and break beans for hours, talking and laughing while we work, so it is actually something I generally look forward to. After washing them pat them dry and then begin the process of snapping and stringing them. Here is a quick course on how to string green beans -- use the "double snap." Take the bean and snap off one end, close to the end of the bean. The string will be clinging to the bean, keeping the snapped end attached. Just pull it down the length of the bean to remove the string, along with the end. Next, snap the other end of the bean, again close to the end. This will pull the other string, from the opposite side of the bean off, as you pull it down the length of the bean. 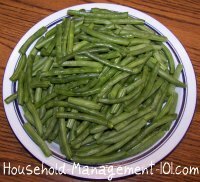 Finally, snap any strung green beans in half or thirds if they are too long, to make more bite size green beans. Hint: Depending on the type and size of the beans you are using they may or may not have a lot of strings. I have found larger beans have bigger strings, while skinnier beans don't, for example. Snapping and stringing beans is a great job for kids. My son, when he was just about 2, loved this job and used to beg to "break-a da beans!" (He'll kill me for sharing that later, but it was just so cute!) Just watch their work, or you may end up with too many strings in the beans, which doesn't taste so good. Add a lid to the pot, and bring to a boil, and then turn the heat down and let it simmer at a low boil, slowly allowing the water to all cook off. Keep the lid on, because this keeps more flavor in the beans. This will generally take a couple of hours. You don't need to stir too often, but be careful once most of the liquid is gone to stir more frequently, just to make sure the green beans don't burn. Once all the water has boiled off, then let the green beans rest for a couple of minutes before serving. Hint: Many people don't actually eat the meat in the green beans, but just enjoy the flavor they impat to them. Others, like my Dad, always look forward to eating a piece along with their beans. 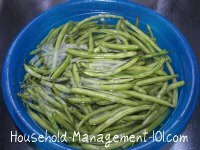 That is our family secrets for cooking green beans southern style. I hope you and your family enjoy this recipe as much as my family does!